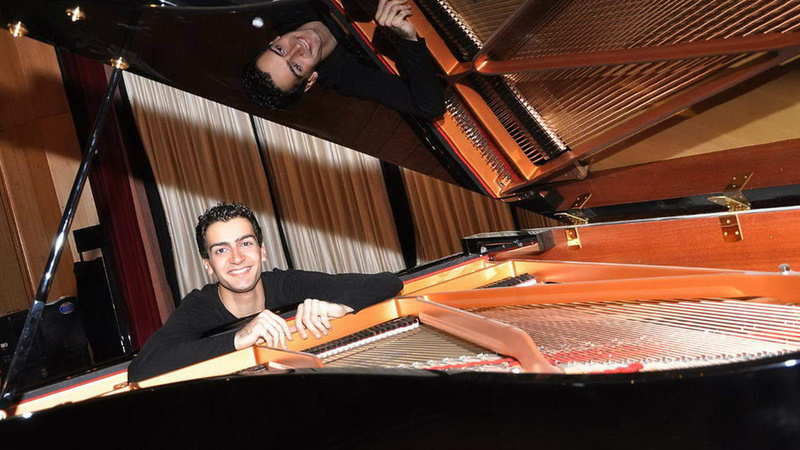 Riyad Nicolas “Syria’s leading young pianist” (International Piano Magazine2012) was born in Aleppo, Syria, in 1989, and has already established himself as a leading figure of his generation on the international performing circuit. Among his recent achievements he lists First Prize at the Francaix International Piano Competition in Paris and his débuts at Wigmore Hall and the Cadogan Hall in London. In June 2015, Riyad graduated with a distinction in a Master of Performance course at the Royal College of Music, studying with Dmitri Alexeev and Vanessa Latarche, as a Steinway Scholar supported by a Frederick Johnston Award. Riyad first came to London in 2005 when he was awarded a two-year scholarship to study at the Purcell School of Music with Sulamita Aronovsky, continuing to work with her at the Royal Academy of Music, where he graduated in 2011. He has participated in masterclasses and was complimented by such musicians as Daniel Barenboim, Vladimir Ashkenazy and John Lill. Riyad has won numerous international prizes and awards including First Prize at the Norah Sande Award in the UK, the Christopher Duke Recital Prize in the UK, the Ciutat de Carlet International Piano Competition in Spain, and First Prize with a recording contract at The Francaix International Piano Competition in Paris. He also won Second Prize at the Seiler International Piano Competition in Greece, Educational Award Prize at The London International Piano competition and Top Prize at the 1st Syria National Piano Competition. He was also selected to be a Tillett Trust Young Artist in 2012 and an artist at the Countess of Munster Trust Concert Scheme in 2014. Riyad made his first appearance as a soloist with an orchestra at the age of ten in Aleppo. Since then, he has performed with many orchestras including the London Chamber Orchestra at the Cadogan Hall, Emirate Symphony Orchestra in Dubai, Young Musician Symphony Orchestra at St. John's Smith Square, the Syrian National Symphony Orchestra at the opening of the new Damascus Opera House, as well as with the Gomidas Chamber Orchestra of Aleppo. Riyad has given solo recitals in many prestigious venues in London, including Royal Albert Hall, Cadogan Hall, Wigmore Hall, St. Martin-in-the-Fields, St. James’s Piccadilly, and Leighton House. He is regularly invited to give recitals hosted by the Beethoven Piano Society of Europe and the Chopin Society UK. He has also been invited to perform in numerous UK musical festivals such as Harrogate, Norfolk-Norwich, King’s Lynn, Brighton, Devon, Darlington, Stratford-upon-Avon, Lincoln, Crediton, and Eastbourne. Concert performances have also taken him to France, Spain, Switzerland, USA (including a debut at Kennedy Centre in Washington) and some Arab States. Riyad has been invited to play for many fundraising concerts especially for Syria from various prestigious organizations such as The International Rescue Commitee, The UN refugee Agency,The Arab British Centre amongst many others. *Riyad gratefully acknowledges the support of Said Foundation, Asfari Foundation, Countess of Munster Trust, Talent unlimited and Help Musicians UK Fleming Award.